Well today is the last day of the celebrations for Chinese New Year. This was my first time experiencing it and also seeing how it's celebrated in Singapore. Sadly hubby had managed to schedule overseas meetings for two weeks, so apart from seeing the decorations and market stalls in Chinatown he missed the whole spectacle. Safe to say he won't be organising anything next year if it can be helped. So we started off with the build up, the streets and malls were decorated. Shops and flower nurseries were selling decorations and traditional mandarin bushes and other plants. 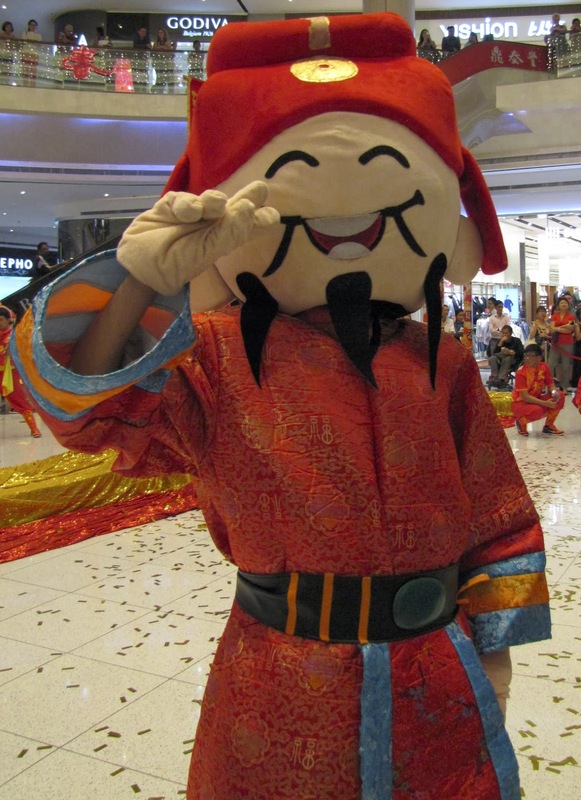 Ever shop and mall played rousing Chinese songs. CNY street market stalls were added to the already bustling Chinatown selling all number of sweet treats. Each time I visited it got busier and busier until it was too manic! On the eve of the lunar year I met up with couple of friends and waited patiently for a number of hours, drinking gin and tonic what they described as "lemonade" which they had brought along in their hip flask and sampling bak wah for the first time. Bak wah is traditionally a sweet/salty dried barbecue meat. Long queues form outside shops selling them. I only tried the original plain version but it was a success with me for sure! On the strike of midnight the firecrackers were ignited - the noise was deafening you could feel it vibrating throughout your body and this was followed by the firework display where all people, regardless of age, get to feel the excitement as if they were still children. 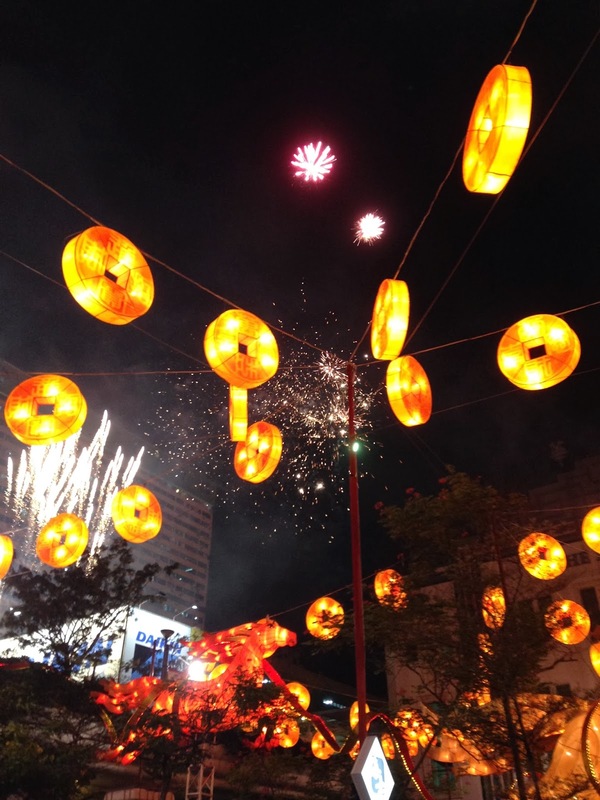 Traditionally these red firecrackers were set off to scare the monster Nian who was frightened off by the noise and the colour red. In modern times though it considered the louder the fireworks the more prosperous the new year will be. For the whole period I could hear numerous times a day the drums from the lion troupes traveling from venue to venue. To start with I wasn't aware what the noise was. I caught brief glimpses of the trucks and I doubted if I would see a lion dance, how wrong I would be! 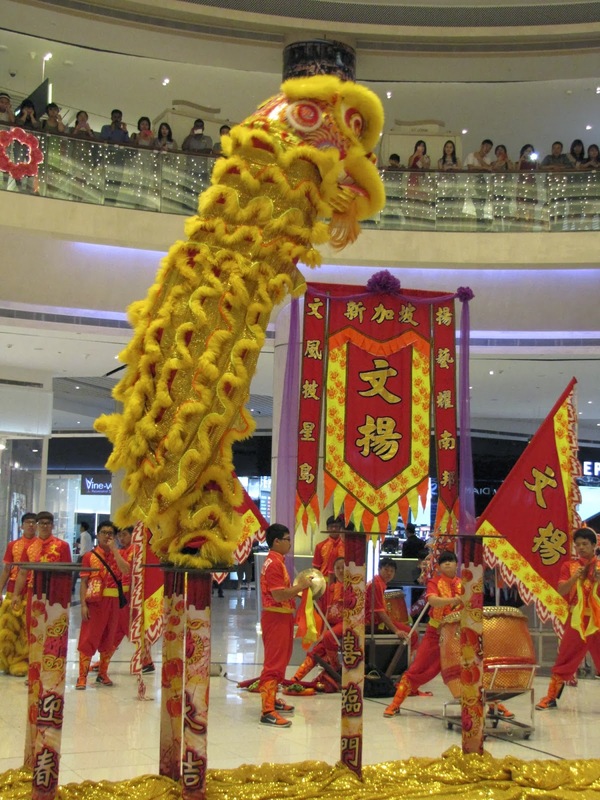 These troupes travel and perform at people homes, condos, area get-togethers and in shopping malls. 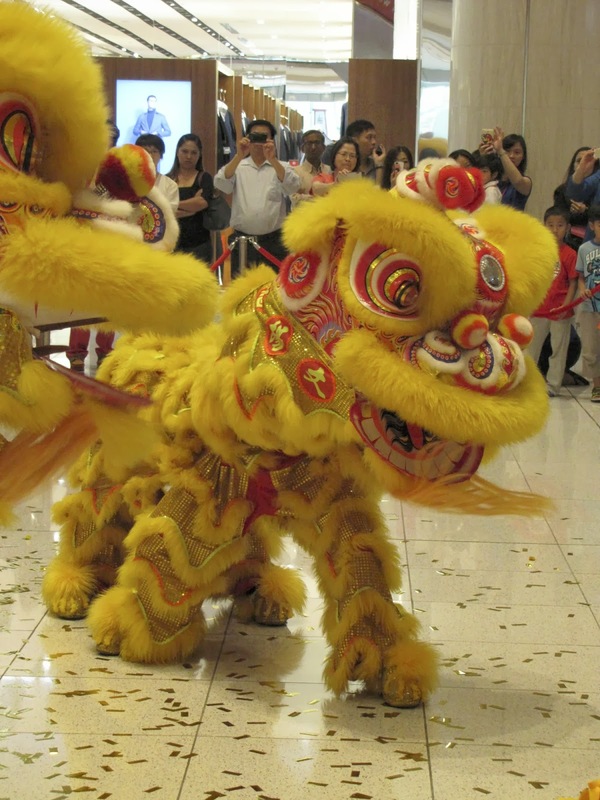 It is considered good luck to have these lions perform for you. In the end I think I experienced around 4 of these spectacles. They were of differing quality and expertise but still made you smile each time! They were all so young, agile and extremely fit. 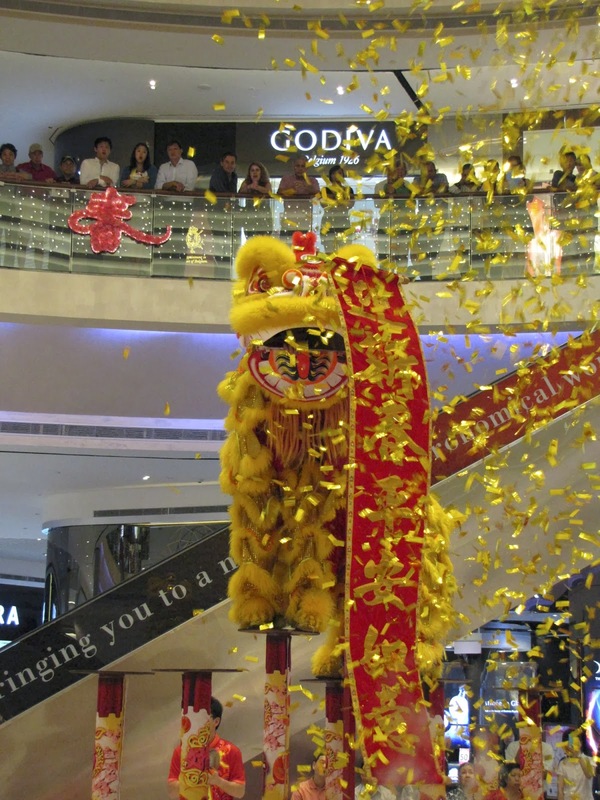 The Lions are accompanied by performers playing loud drums and cymbals aiding the lion in frightening off the evil spirits and the lion starts to dance and perform to ward of these spirits. 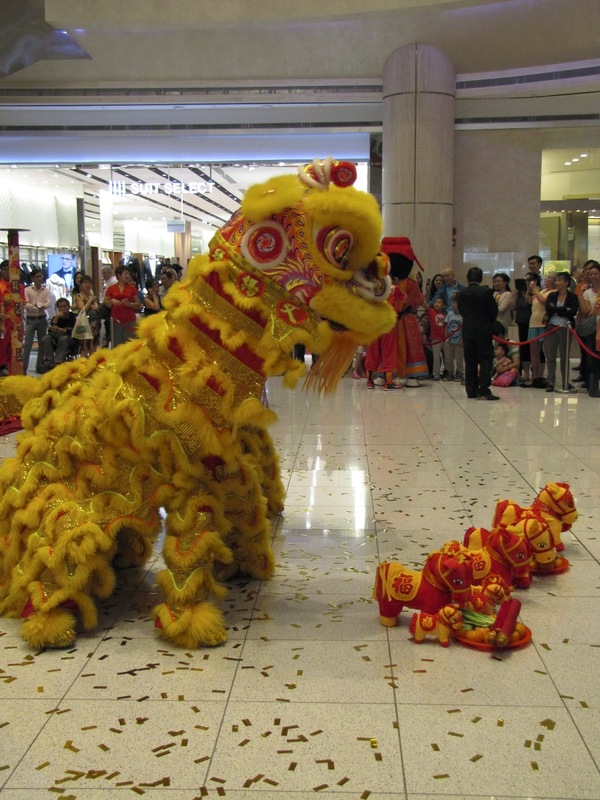 The lion or lions are often accompanied at these events by the God of Good Fortune. 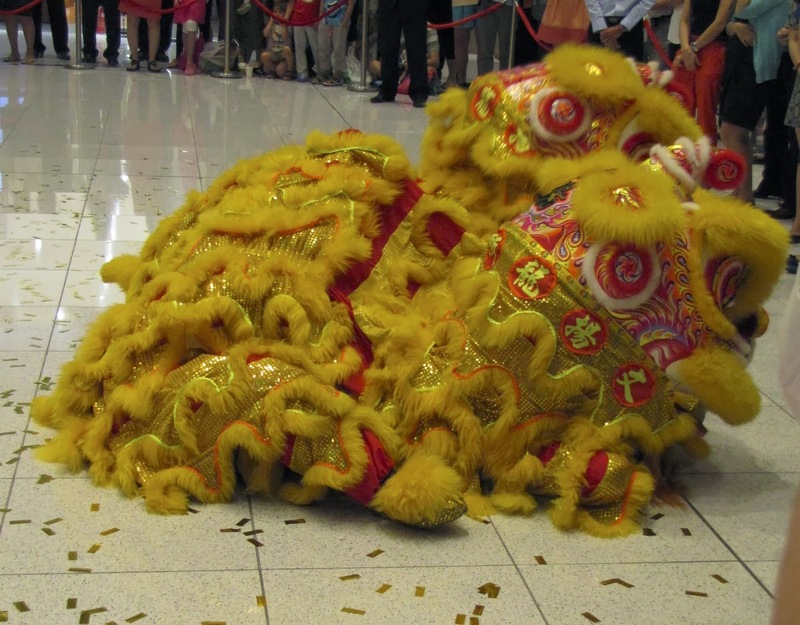 During these dances the lions climb and jump over stilts performing cai quing where they seek out lettuce or greens. Hidden amongst these greens are red packets (Hongbao) containing money. The lions "eat" both red packets and greens keeping the money as a reward for seeing off the evil spirits and then spitting out the greens. Often the lions will be given oranges to eat which they will spit out to the audience. When the greens/pomelos/oranges are spat out, it is considered they are spitting out good fortune. They will also sometimes spell out lucky numbers with the orange segments. A fellow blogger has told me she's seen large queues for the lottery today - I wonder how accurate these lions are!! The seventh day of CNY is everyone's birthday. 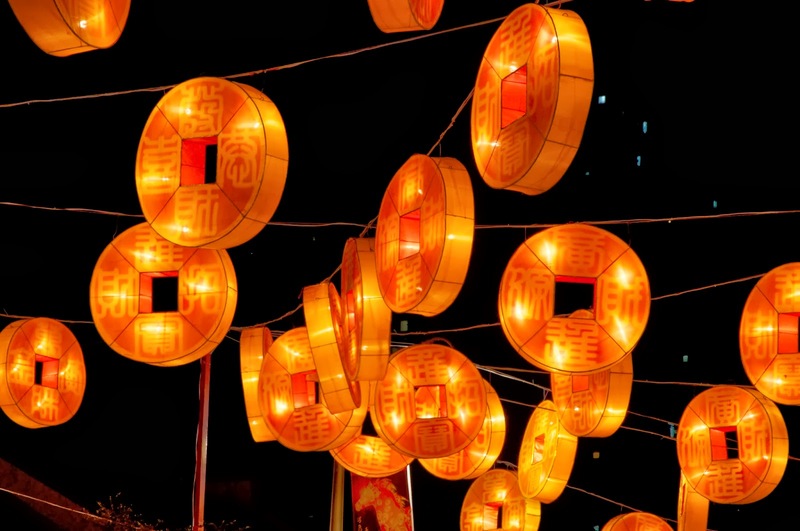 Traditionally in China birthdays weren't celebrated rather everyone became a year older on the seventh day of the lunar new year. Traditionally the fish salad of yusheng was eaten on this day although it's served now throughout the festivities. For more information on what each day of the festival means can be found here. And today is the last day, this year falling on Valentines Day. 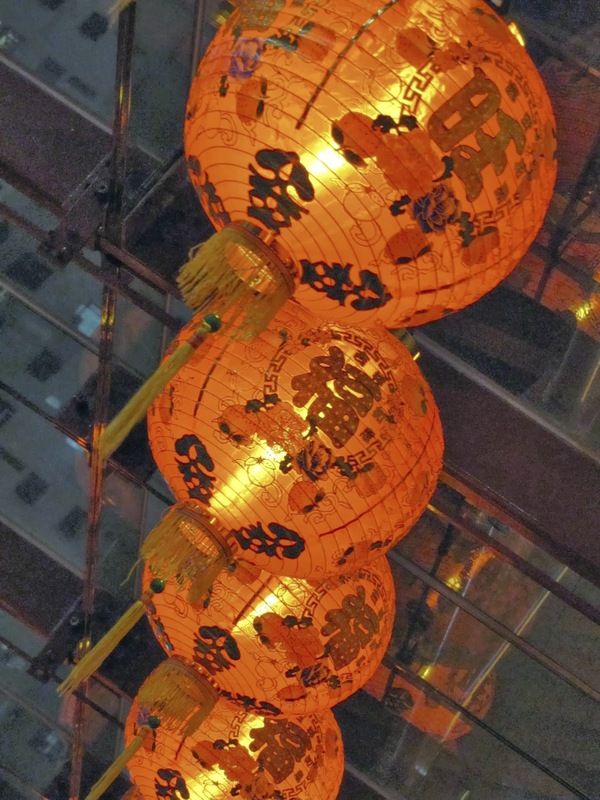 The 15th and last day of the lunar new year is known as Chap Goh Meh. It's very good luck to meet your partner on this day and as this year falls on Valentines Day, which only happens every 19 years, it's even more lucky. Traditionally girls would throw oranges, with their details on, into the river to be caught by their future partners! Good luck girls!! 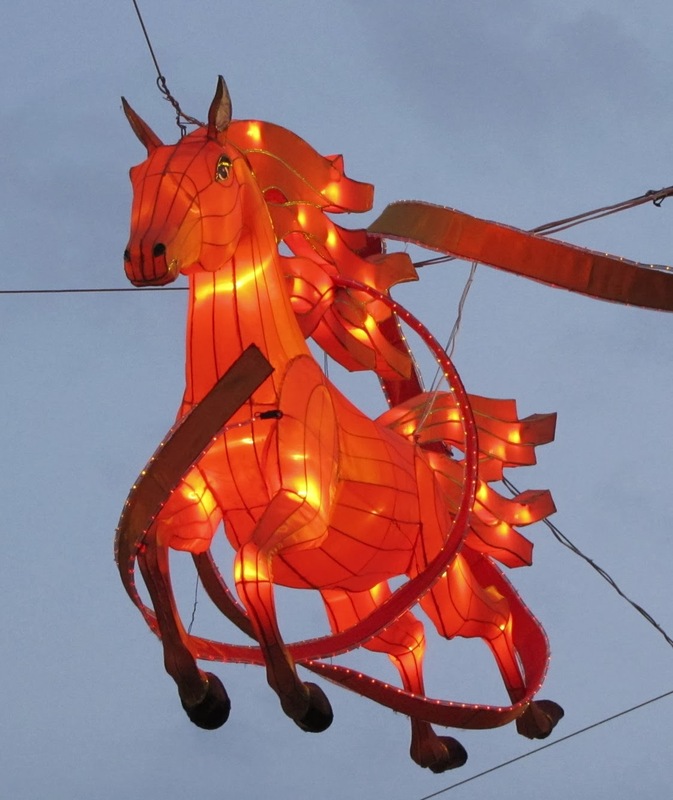 Anyway it's now time to take down the decorations and see what the Year of the Horse has in store for us.